Do you remember reading the books of Marguerite Henry as a child? I sure do. Misty of Chincoteague, King of the Wind, and so many others, including one of my favorites, Brighty of the Grand Canyon. Like so many places in the Southwest, the spirited brays of our burros no longer echo through canyons and across stark desert landscapes. Despite their unnecessary and sometimes brutal removal at the hands of the BLM, a few wild burro herds do remain. My dear friend and long-time business colleague, Anni Williams and I set off on a determined journey to find them in their last stronghold–Arizona. We begin in Oatman, Arizona, famous for being on historic route 66, and for burros that stick their noses into car windows, spoiled by tourists who unwisely give them treats. But Anni and I are looking for the truly wild burros, those that rely on their wits to survive. We don't have long to wait. Just across Sitgreaves Pass en route to Kingman, we spot a group of handsome jacks (males). They are as wary as the Oatman burros were pushy. Anni, Ann Evans and I looked for burros in the Cibola-Trigo Herd Management Area in 2013 and found only dried up turds, but here is the real deal. How in the world could you not appreciate these handsome boys with their very long ears and shining, deep-set eyes? Just a half hour from our wonderful jacks, we stop at the Kingman BLM office and ask directions to the Spanish Cerbat mustang herd, one of only two wild horse herds managed by the BLM in the entire state. Regardless of their links to the horses of the Conquistadors, the Cerbat herd is managed at the genetically non-viable level of 60-90 horses on over 80,000 acres of mountainous terrain. We don’t hold out much hope of finding them, but while we're in the neighborhood, we decide to give it a shot. Following directions from a BLM employee, we travel 15 miles north of town. The sun is already dipping low over the mountains when we turn onto a dirt road. In time, we see horse tracks and droppings! As we near a well, a bay horse bolts out from the shadows of a mesquite tree. Anni creeps slowly forward and stops the car when we see movement behind a jumble of spiny shrubs and prickly pear cactus. The bay is foraging, and we can see he is a stallion. I slip out of the car with my camera. Above the stallion we spot more horses. Two young sorrels, and a black mare with a tiny foal at her side stare down at us from a quarter mile away. While Anni waits below, I slowly follow the stallion uphill. He stops and turns and I stop. So Spanish looking, I think. His small hooked ears take in every sound I make, but they flick back to listen to his family walking above him. The stallion relaxes and starts to select for the first shoots of green grass coming up amongst the thorny underbrush. I retreat, excited to have spent time with horses I first heard of 21 years ago when I started my wild horse journey. It is nearly 9 at night when we arrive in Surprise at the lovely home of our newest Board member, Sandra Sell-Lee and her husband Bill. The next morning Sandra, Anni and I are on the road to the Salt River where we meet up with our friend, Karen McClain who proves to be an extraordinary guide. 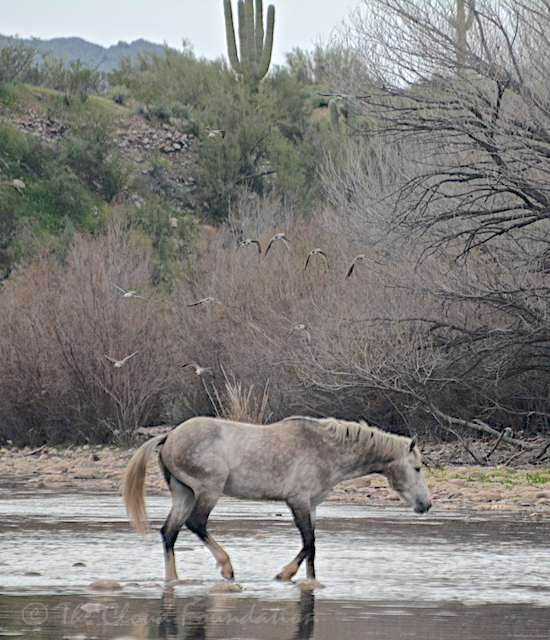 At each stop along the river, wild horses appear in bachelor bands and family groups, some with foals of the year. Bald Eagles soar overhead and great egrets fish on the rocky banks within feet of the horses. Kingfishers dive for little fish and a flock of common mergansers float by as band after band of wild horses come to drink and rest. What an amazing place! I have seen pictures and videos but there is nothing like being here. While I am engrossed in shooting live action, Karen picks up my still camera. Many of the photos you see here are Karen’s, and I thank her for this. She is also a dedicated advocate, terrific guide, and an extraordinary artist. Karen sits for hours, creating oil paintings of the horses from life. This special day flies by for all of us. The next morning Anni , Sandra and I head north, looking for burros in the hills around Lake Pleasant. Within minutes of turning off the highway, we spot our first burro on a distant slope. This will be easy, I think to myself. Anni and I say goodbye to Sandra and travel west toward our final Arizona destination, Lake Havasu City just east of the Colorado River. At twilight we near the Davis Dam about an hour south of our destination. We’d been told that burros frequent the California side of the river and we can’t resist this opportunity. Less than a mile down the road we start seeing groups of burros. Unlike the wary ones in Lake Pleasant and on Sitgreaves Pass, these burros are more like the burros in Oatman. Later we learn that, although it is illegal, the burros come to the road where they receive handouts from locals and tourists. It’s not unusual for them to be struck and killed in this area and Anni has to swerve to avoid hitting a juvenile burro rushing to get a handout from a truck. More signage and a fine for this irresponsible behavior should be posted, something we plan to suggest to the California BLM office. It’s well after dark when we arrive at Anni’s sister and brother-in law’s vacation house. From this base of operations, we begin exploring the vast Lake Havasu Herd Management Area, over 450,000 acres of volcanic mountains, open hillsides sprinkled with creosote bushes, and sand washes punctuated with cactus, mesquite and palo verde. Following suggestions from Anni’s friends in the area, we travel north the next morning and turn onto a dirt road that wends its way through a huge campground on BLM land. RVs new and old, of every conceivable shape and size, are wedged into sandy turn outs. Delicate wild flowers are just beginning to bloom. Tiny Verdins flit in and out of the palo verde. Flashy Gambel’s Quail dash into the underbrush. A desert cottontail hops into a dense thicket. Its ears are noticeably longer than our mountain cottontails which makes sense in a desert where temperatures can soar to over 125 degrees on occasion. Miles beyond the camp, we still haven’t seen signs of burros. Then, on our way out, less than a mile from the highway, we see a group of six jack burros standing atop volcanic rocks on the side of a jagged peak. Do you think they were there all along,? I ask Anni, whose excitement mirrors my own. These burros are every bit as wary as the other unspoiled ones we’ve spotted. In time they seem to relax, moving a bit closer to forage. I hope they’ll tolerate me moving uphill at a snail’s pace. I get maybe 30 feet closer and their eyes lock onto me. Before they feel the urge to run away, I back up, respecting their space. The next day, Anni’s childhood friend and artist, Sue Kessler joins us, driving us west of the highway on roads where she and her husband have seen burros. We climb steep slopes and then wind downhill parallel to the Colorado River. At a wide wash with high ridges on both sides, we stop and start hiking. Within a few minutes we see droppings and tracks. But, after a long hike, we still don’t see the burros who made them. Anni and Sue decide to meander back. But, unwilling to give up without a sighting, I press on, hiking up onto the high ridge to my right. I follow a trail that I am sure was made by little burro hooves. I can see the Colorado River in the distance. What a lovely place, I think, hiking on. I stop and start to glass into the wash. Movement! Our journey comes to an end but not our fight to preserve the few burros that remain in the desert southwest. For the first time in the history of the Wild Horse and Burro program, the BLM has removed so many burros that they are now stockpiled—caged in dirt corrals. My flight home takes me through San Francisco, and I have time to reflect on our adventures in Arizona and the plight of America's wild burros and horses. As long as as one wild desert burro or wild horse remains, we’ll fight for their right to live in precious freedom. I hope you will help us help them. P.S. To those who have worked so tirelessly to protect our remaining wild burros for many years, like my friend and fellow advocate Marjorie Farabee, thank you! And also thanks to Congressman Raúl Grijalva (D - AZ) for valuing the spirit of the west and our wild burros and horses.